Explanation: That's no sunset. And that thin red line just above it -- that's not a sun pillar. 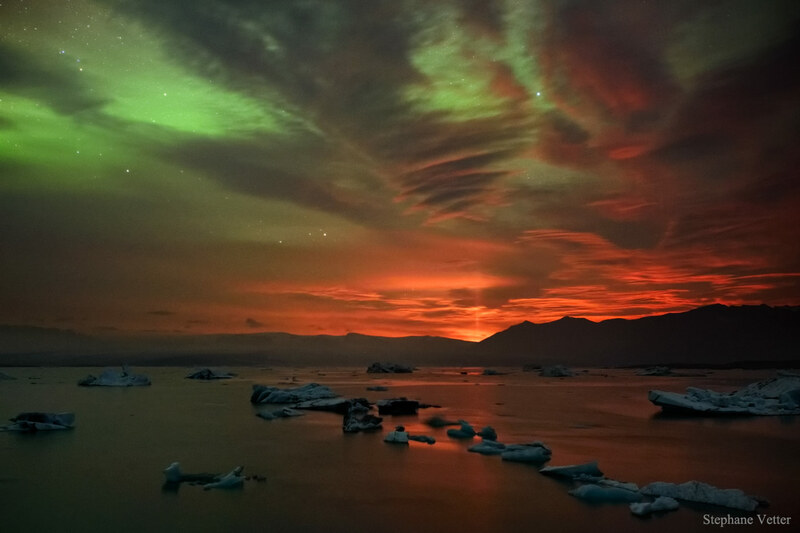 The red glow on the horizon originates from a volcanic eruption, and the red line is the eruption's reflection from fluttering atmospheric ice crystals. This unusual volcanic light pillar was captured over Iceland earlier this month. The featured scene looks north from Jökulsárlón toward the erupting volcano Bárðarbunga in the Holuhraun lava field. Even the foreground sky is picturesque, with textured grey clouds in the lower atmosphere, shimmering green aurora in the upper atmosphere, and bright stars far in the distance. Although the last eruption from Holuhraun was in 1797, the present volcanic activity continues.